CITY LIMITS FESTIVAL is back in 2019! And Regurgitator take up the invitation finally. 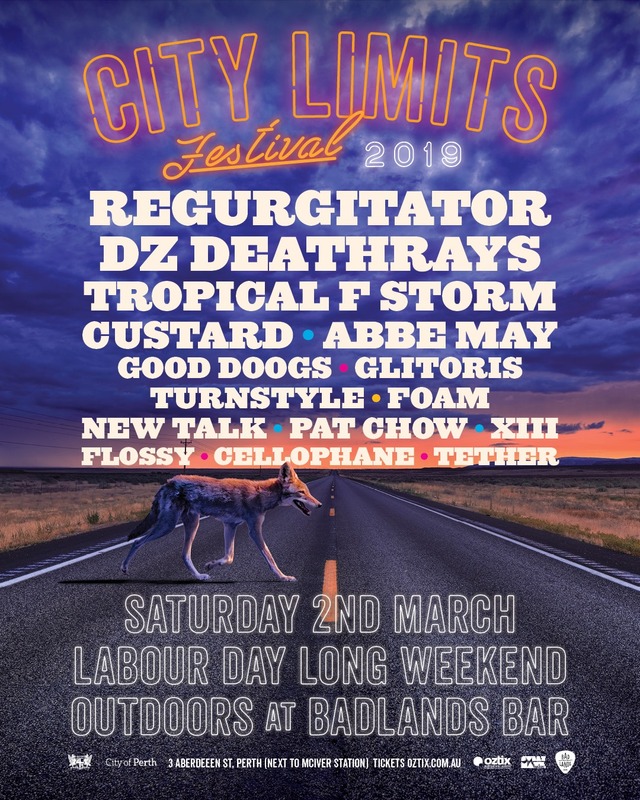 The Aussie music behemoth that is City Limits Festival once again descends on Badlands Bar and its Carpark in 2019 – mark Saturday 2 March in your diary now! The third edition of the festival brings you its biggest lineup yet, and we’re thrilled to have the legendary Regurgitator on board to headline the show. Anyone who witnessed their two sold out shows at Badlands in August can attest The Gurge continue to bring their live show A-game. Recently celebrating 10 years together, DZ Deathrays will be hitting CLF2019, as will the genius of Tropical F**k Storm, evergreen WA fave Abbe May and everyone’s favourite Mandurah bozos Good Doogs. Canberra’s Glitoris were so incredible when they played Badlands earlier this year we just had to ask them back, and there’s more local goodness courtesy of Flossy and Cellophane. Plus, we’re extremely lucky to have XIII on board – this is the much anticipated new project from Gyroscope frontman Dan Sanders and will be a real treat for the festival early-comers. Once again we’ll be using the Carpark stage and the Badlands Main Room, plus there’s food trucks, easy public transport (right next to McIver train station) and as per previous years, we’ll be aiming to keep the dickhead factor to a minimum. A band that occupies a similar space in both style and era, TURNSTYLE are also hitting the stage. The band have just released their new (and fourth) album Happy Factories. This is a very rare chance to catch them live. Rounding out the line up to make City Limits Festival the ultimate party are local legends FOAM, NEW TALK, Pat Chow and newcomers Tether. They will be joining the already-announced lineup of Regurgitator, DZ Deathrays, Tropical F**k Storm, Abbe May, Good Doogs, Glitoris, XIII (the new project for Gyroscope’s Dan Sanders), Flossy and Cellophane. Once again we’ll be using the outdoor stage and the Badlands Main Room, plus there’s food trucks, easy public transport (right next to McIver train station) and incredible vibes! City Limits Festival 2019 is proudly supported by City of Perth and Oztix.